Strong-willed and proud, a Syrian refugee girl enjoys learning and playing at a social development centre in Byblos, Lebanon. BRUSSELS/AMMAN, 6 December 2016 – An exhibition by UNICEF and the European Commission opened in Brussels today as a visual display of the human cost of the Syrian conflict and the powerful will to persevere by children, young people and families who have fled unspeakable horror. The exhibition, titled “Standing Strong: Human Faces of the Syrian Crisis” presents some 24 photos by war photographer Sebastian Rich who travelled to Jordan, Lebanon and Turkey in October to meet with Syrian refugee children and families and give them a voice through the images. The photos are on display at the Berlaymont Building in Brussels from 6 to 15 December. The exhibition will also feature drawings by Syrian refugee children from the three countries, giving insight into dreams, fears, thoughts and an unfiltered view of what war looks like through the eyes of a child. The drawings reflect aspirations for peace along with memories of the children’s homes, gardens, toys, friends and schools they left behind. The display is a tribute to the stories and struggles of more than 2.5 million children and their families who have fled the brutal conflict in Syria. The exhibition is made possible through the continuous partnership between the EU and UNICEF and is funded by the EU Regional Trust Fund in Response to the Syrian Crisis. Through the work of UNICEF and partners, and with generous funding from the EU Trust Fund, hundreds of thousands of children and youth from Syria, now refugees in Jordan, Lebanon and Turkey, along with vulnerable host communities, will have access to learning, education, protection from harm and psycho-social support. The needs of children and youth are immense and growing. Today, one in three Syrian children have grown up knowing only crisis and conflict, and a generation of young people have come of age during times of war. More than 2.4 million are out of school inside Syria and in neighbouring countries and at added risk of abuse, violence, child labour and early marriage. These are real-life issues as told by the children and families captured in the photographs and through the drawings. Images include the cupped hands of a little girl holding a tiny drawing she made of a bleeding friend; a young girl poring over a book and eager to learn; and a set of brothers from Homs who are now members of a youth theatre group that helps spread positive messages to their communities – from ending violence to dealing with the pressures of life as a refugee. 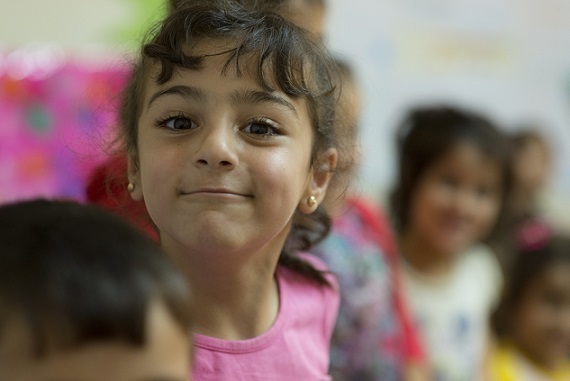 So far, the EU Trust Fund has provided €102.5 million in support of UNICEF’s work to support refugees and vulnerable host communities in Jordan, Lebanon and Turkey. The European Union is the leading donor in the international response to the Syrian crisis with an overall total of €9 billion from the EU budget and Member States collectively allocated in humanitarian and development assistance since the start of the conflict in 2011. The European Commission’s support in response to the Syrian crisis has now exceeded €3.4 billion, including both immediate humanitarian assistance, and non-humanitarian aid.